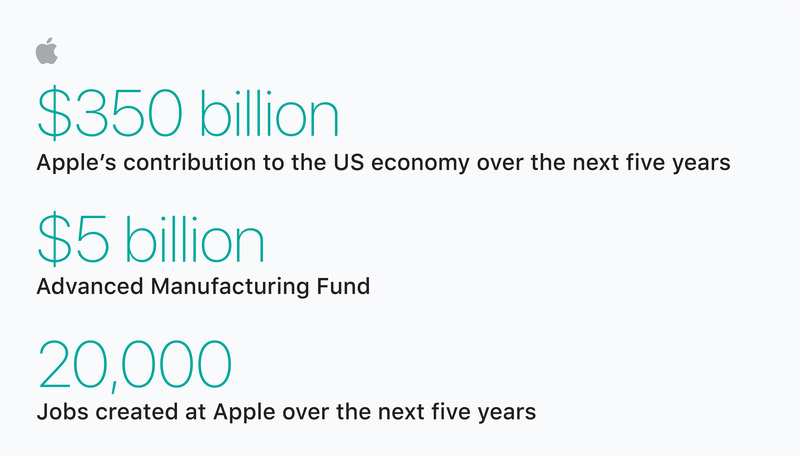 In a press release posted yesterday morning, Apple has revealed a multi-tiered attempt to revitalize the US economy, while also giving American citizens more job opportunity as a result. The company has devised a set of new investments that will help the California-based tech giant "build on its commitment to support the American economy and its workforce, concentrated in three areas where Apple has had the greatest impact on job creation." These three areas of interest include "direct employment by Apple, spending and investment with Apple’s domestic suppliers and manufacturers, and fueling the fast-growing app economy which Apple created with iPhone and the App Store." This comes as a direct combination of Apple's new investments, as well as their commitment to spending with domestic suppliers and manufacturers. In 2018 alone, the company plans to have contributed over $55 billion to the US economy, while within the five years, Apple predicts a $350 billion stimulus. These figures do not include the company's "ongoing tax payments, the tax revenues generated from employees’ wages and the sale of Apple products." Apple's CEO Tim Cook reveals how the company believes "deeply in the power of American ingenuity, and we are focusing our investments in areas where we can have a direct impact on job creation and job preparedness. We have a deep sense of responsibility to give back to our country and the people who help make our success possible." LaVar Ball Files Trademark For "Junior Basketball Association"